I think maybe I live in a false reality. Ok, let me rephrase that. My brain lives in a perfect world, and it makes plans and lays them out with such good intentions. Oh, wait...I guess it is not just my brain, it is me. When I am making plans I forget to include little things, like...eating. Eating is overrated. Right? Wrong. And people also think they need clothes...clean ones. I can do that, just don't expect them to be folded. Digging for that sock mate for 10 minutes when school starts in 5 builds character right? Then, there are all the other things life throws out, like kids needing stitches...life is full of fun little surprises. I guess my point is, when you think you can bust out something in a weekend...say?...I don't know...a bedroom makeover for example, including making the bed. That is a false reality!!! At least in my case. So bear with me...like Michelangelo paining the Sistine Chapel, someday I will make an end! My bed is waiting patiently in the kitchen as we speak. Sorry for that random thought...I needed to get it out, thanks for those of you that actually read it! 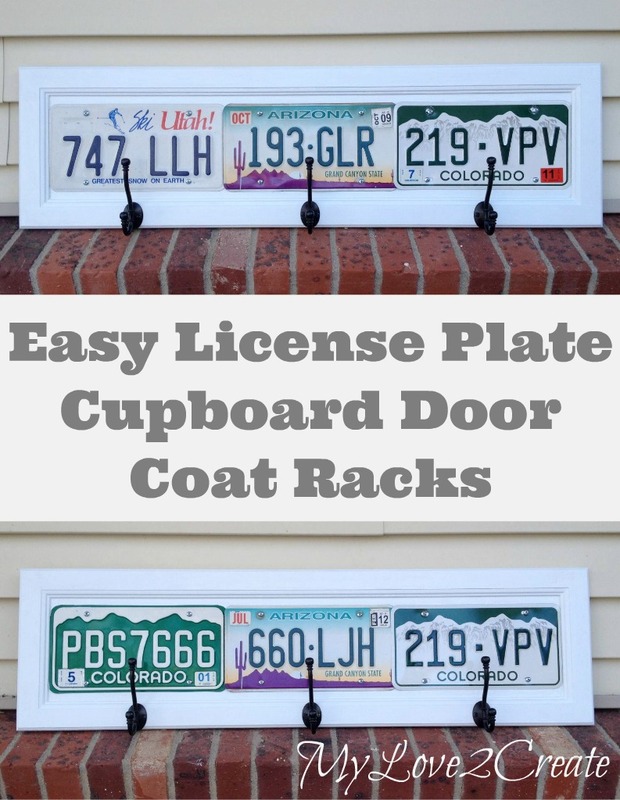 Back in January I shared this post at My Repurposed Life and at the time I had not yet done my Hall Closet Makeover, so it was a huge life saver. I love them because they were super easy to make and they are being used daily in my home! The license plates inspired several stories and explanations to my kids, and it was very enjoyable to take a trip down memory lane with them! Please take a minute and check out my tutorial! This is so cute. 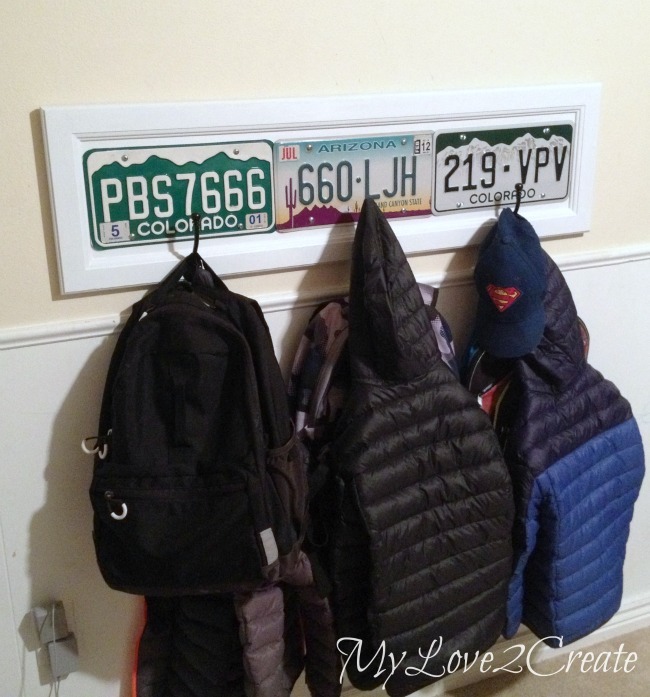 My husband is military, and it'd be really neat to do this with license plates from all the places he's lived. Course, it'd be too big for a coat rack, but it's giving me an idea for his birthday present! Love this to pieces! It's perfect for my son's room. I need to find license plates! Thank you for sharing at Happiness is Homemade party, Mindi! Don't beat yourself up, did you see that it took me 5 years just to figure out what to do with that silly pediment? Seriously still LOVE this project. Hope your week is going great, get some rest. This is so cool. I love it. My brain is constantly going and I know I will never catch up. Thanks for sharing this. Lady, I completely understand what you are saying. Yep, an "easy" project is usually not easy when real life happens; especially, with kids. It is what it is and I am sure your readers understand. I hope mine do. lol Mindi , I don't eat when I do projects, unless it is a super quick, no cooking snack. I do keep hydrated, though. Real life DIY blogging is NOT HGTV or other fancy decorating show. Trying to get projects done around family life, is not easy. I LOVE this coat rack! Very original! :D Is the coat rack still up in that location since you have done your coat closet? It would look cute in the boy's room. Thanks for linking up at the Talented Tuesday Link Party :-) It would be great if you joined us again this week! Perfect! I am going to do it!! Thanks so much for sharing at Something to Talk Abput!! Such a fun idea! Everything I do always takes longer than I think and I don't even have to deal with kids at home. lol! Thanks for sharing with SYC.